Running Press Kids, 9780762447268, 24pp. 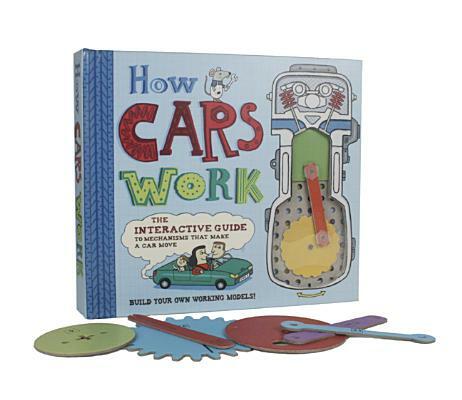 Kids' passion for cars has always run fast and furious, and this interactive book and kit gives enthusiastic gearheads the opportunity to build the essential parts of a car easily and independently. Colorful and energetic, How Cars Work details the principles for ten basic car mechanisms and includes examples of their everyday use, helpful timelines detailing each part's history, and straightforward instructions on how to build each mechanism. All of the materials needed to build each mechanism are contained within the kit, including machine pieces, nuts and bolts, and a detachable peg boardall color-coded for easy identification. The projects include: wheels, gear box, steering, exhaust valves, timing belt, pistons, suspension, accelerator pedal, and brakes. This follow-up to How Machines Work is hands-on and engaging, certain to inspire the DIY spirit in every child! Allan Sanders is the illustrator of How Machines Work and internationally renowned for his powerful, quirky illustrations, which have appeared in such publications as The Economist, The Guardian, New Scientist, and the Los Angeles Times. His interactive and animation work has been featured in exhibitions at the London Science Museum. He lives in Brighton, England.